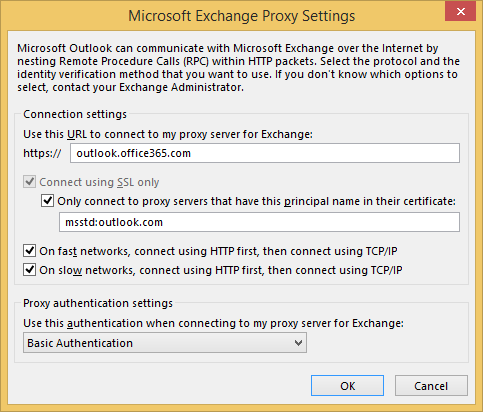 Manually configuring Outlook for Office 365 can be tricky. That’s what Autodiscover is for. But in some situations you have to be able to do a manual configuration in for example a pilot deployment. Here are the steps required. 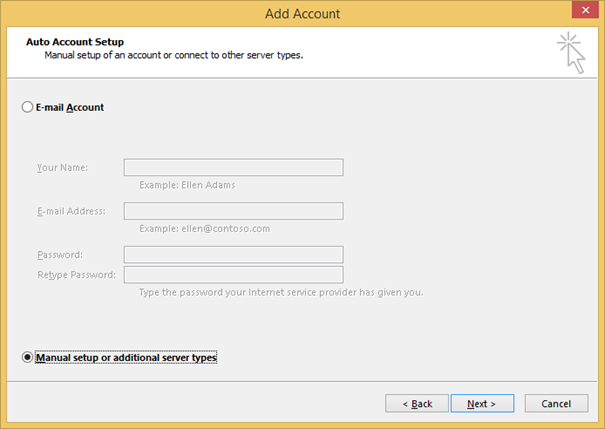 The nice thing with this method is that we will be able configure Outlook without changing our Autodiscover DNS records. 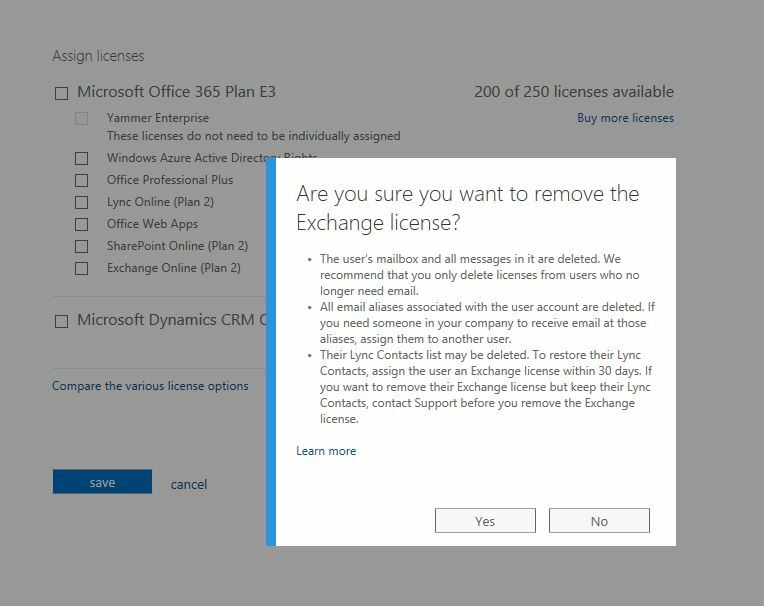 That means we can do a full Office 365 test deployment without affecting users in an on-premises Exchange environment. 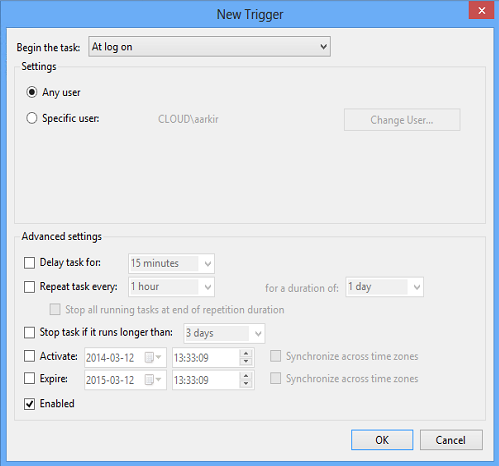 The first step is to establish a remote PowerShell session to Exchange Online. Here we need the ExchangeGuid attribute from our mailbox. Copy this value and save it for later. The next step is to launch the New Profile Wizard in Outlook. We will go for the option to do a Manual setup. 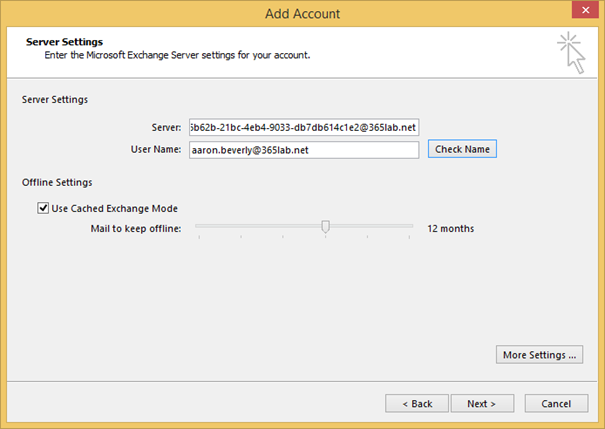 In the next screen we select that we have a Microsoft Exchange Server. 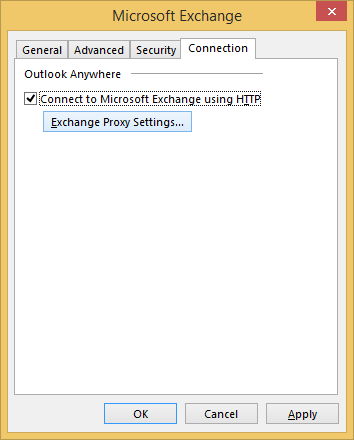 Now it’s time to enter the exchange server name. Here we need the ExchangeGuid from the first step. Write the Guid followed by @ and the email domain. The user name is our Office 365 user name. On the Security tab we select Anonymous Authentication. Click OK to close all windows. 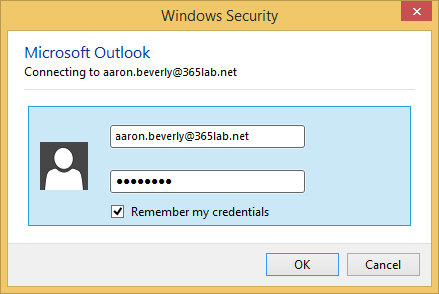 You will be asked for credentials, fill in your Office 365 username and password. 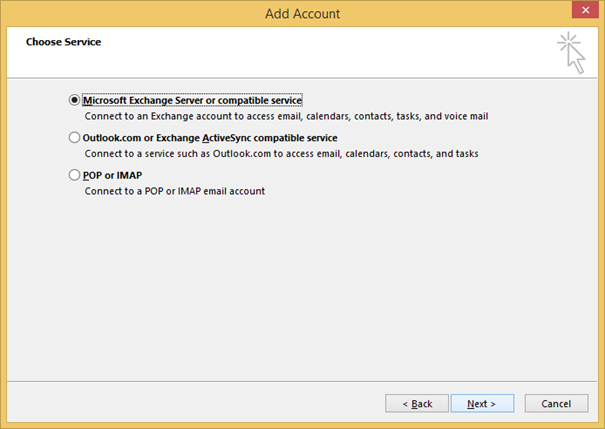 Now our Outlook Profile is ready to use and Outlook is configured for Exchange Online, without using Autodiscover. 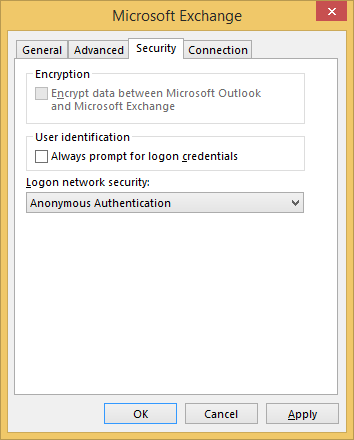 This entry was posted in Exchange Online, Windows Client and tagged autodiscover, manual outlook configuration, outlook profile on March 17, 2014 by Andreas Lindahl. Logging on as Domain Admin to end user workstations? Think again! An end user has a problem with their computer or needs manual installation of some software. Either we elevate with an admin account logged on as the end user, or we switch user and are logging on with our admin account. Far too often, the admin accounts used to help out end users, are very privileged accounts, 2/5 times I see this at my customers those accounts are Domain Admins. Why is this a problem? Well, first of all, you should never expose very privileged credentials to “non trusted” computers. Secondly, at the time you log on, your credentials are exposed and can with Benjamin “gentilkiwi” Delpy’s tool mimikatz be extracted in clear text through the lsass process. Ok, but the user is not local admin, so they will not be able to do it anyway? That is true, but far too many let end users be local admins, and of course there are ways to get around that if you’re a non admin user as well. The end user Aaron that has been privileged enough to get local admin rights on his computer. He puts the powershell-script Invoke-Mimikatz.ps1 as a task to run at logon for all users. In this example, I’ve just put in the row below in at the end of the script to dump the credentials to a file on the c-disk. This could of course be dumped anywhere if you wanted to. Now, when his fellow administrator logs on to his computer to help him with some software installation, the admin credentials will be dumped to a file and Aaron is from now on Domain Admin! Lesson learned: Think both once and twice before logging on with privileged credentials to non trusted computers. This entry was posted in PowerShell, Windows Client, Windows Server and tagged admin passwords, credentials, invoke-mimikatz, mimikatz, schedule task mimikatz on March 12, 2014 by Johan Dahlbom. In Exchange 2003 Resource Mailboxes and Shared Mailboxes are often set up as a regular user mailbox. These mailboxes are still possible to migrate using Staged Migration or Cutover Migration, by migrating them as a regular user mailbox. The downside is that they will require an Exchange Online license. If you are migrating from an Exchange version that supports Hybrid Migration you will be able to migrate resources directly without assigning licenses, but there is a workaround for Cutover and Staged migrations as well. To convert a user mailbox to a shared mailbox we just need one line of PowerShell. Except from changing the type, we also have to modify the mailbox quotas. After this is done the license can be removed. You will get a warning that your data will be lost, but it is safe to click Yes on this one. This entry was posted in Exchange Online and tagged remove license, shared mailbox on March 10, 2014 by Andreas Lindahl. A while ago, I posted a script that helps you out informing end users and starting remote mailbox moves in hybrid migration scenarios. In the script we started our mailbox moves with the -SuspendWhenReadyToComplete switch. That switch means we manually have to go in and resume the mailbox moves with the Resume-MoveRequest cmdlet. In this follow up script, we automate that process by monitoring active mailbox moves and handle resuming and removing of them. We also have the possibility to send out emails to our end users when the move has been completed (if uncommenting row 78). Note: The script only works as intended if you have created one moverequest per user, as done in my script that start the migrations. Script that monitors remote mailbox moves in Exchange Online and handles resuming, removing of them. You've just been moved to Office 365, if you have questions regarding the move, or if anything is not working as intended, let us know! $emailFrom = "Office 365 <migration@365lab.net>"
$subject = "Migration batch Finished"
Write-Output "INFO: Move request for $($MoveRequest.Batchname) at $((Get-CloudMoveRequestStatistics -Identity $MoveRequest.BatchName).PercentComplete)% $(Get-date -format u)"
Write-Log "INFO: Completing mailbox move for $($MoveRequest.BatchName) at $(get-date -Format u)"
Write-Log "INFO: Removing completed MoveRequest $($MoveRequest.Batchname) at $(get-date -Format u)"
#Uncomment row below to send information to end users when migration has been completed. Write-Log "INFO: All migration batches finished at $(Get-Date -format u)"
#Send information to admin then the batches are complete. Hope this is at any help, just let me know if you have suggestions that can improve the script. This entry was posted in Exchange Online, PowerShell and tagged get-moverequest, hybrid mailbox, hybrid migration, office 365 hybrid, remove-moverequest, resume-moverequest on March 9, 2014 by Johan Dahlbom.